The Winter coat of all Winter coats This gorgeous coat is from Primark, I know? Primark! Even better, I got it for £25 which is an absolute bargain as it was meant to be £28. I cannot wait until the cold weather properly sets in so I can wear it all day everyday, I mean, what is this sun about? Go away, it's October! Autumn Yeah, yeah I know what you're thinking... "Here she goes babbling on about Autumn again." But really, the leaves are changing colour. That makes me so excited, if you hadn't already guessed! There's just something about hearing the crunch of the leaves under your shoes that is oddly satisfying. Dorkface AKA Jemma If you haven't heard of Jemma then you must be hiding under a rock. Not only does she have an amazing blog *cough, winner of the best Social Media AND the Up and Coming Lifestyle blog awards*, she also makes things! I'm talking prints, brooches, jewellery and phone cases, and they're all available on her Etsy shop! I treated myself to a handmade card and a pair of the cutest little cloud earrings which have led me to believe that I'll be back in the future to buy more. IKEA Who doesn't love IKEA? I promise I don't go especially for the meatballs *shifty eyes*, ok I lied. When I visit I find myself overwhelmed by the number of candles and fake plants that they sell and usually end up buying everything I don't need, I'm looking at you broccoli plushy. The showrooms are an absolute dream and any blogger's "room goals"! London It has been my dream for years to visit Hyde Park's famous Winter Wonderland, and this year I'm actually going!! Me and my mum decided on going just for the day in November (works out much cheaper, trust me). The train tickets were booked in September and I can't frickin' wait! You can sure bet my camera will be coming with me and a blog post will be written up about my trip. Pizza, Movie, Blanket I love pizza, and what's better than to show that love to the streets of Manchester than to buy a slogan tee showing just that?! Hazel from Hazel Jane instagrammed herself wearing this shirt and I just had to have it! If anyone is interested on where to get it, it's from Pull&Bear for an amazing price of £5.99. Kinder Bueno Milkshake I came across this lovely little coffee shop whilst candle hunting in the Lowry Outlet a few weeks ago. They can turn almost any chocolate bar into a milkshake, I was overwhelmed by the choice but opted for Kinder Bueno. It did not disappoint, I'm not one to have a sweet tooth but sometimes sugar is necessary. Along with a cheese and ham toastie, accompanied by a gooey chocolate fudge cake, it was the perfect indulgent lunch. Suede Having never really been a fan of suede in the past, I have to say I'm loving it being on trend this AW! 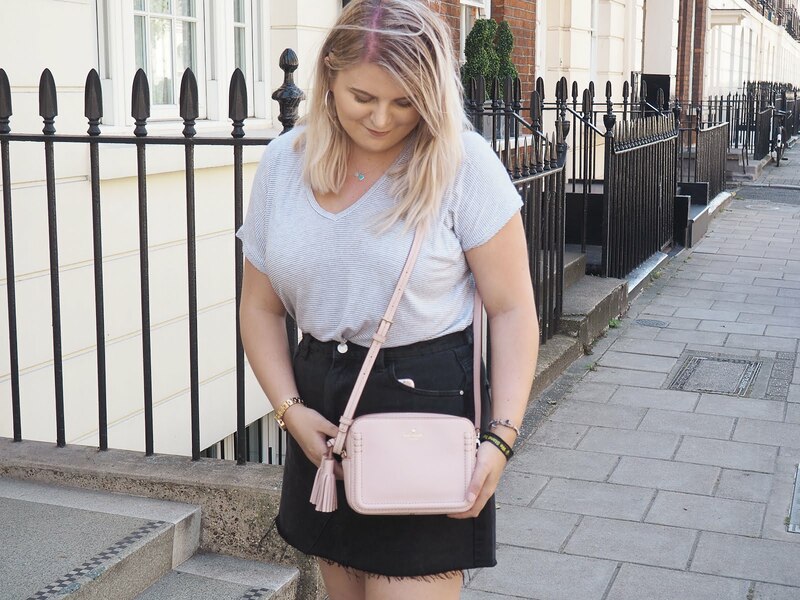 This skirt is from Primark, again, (so is the top in case you were wondering) for only £10, I think, don't hold me to that! Phew, that was a lot of commas. I'm not overly confident about my body which I plan to post about relatively soon, but I wanted to include this photo from a mini outfit shoot I did at the start of the month. Llandudno If you are a regular reader of my blog then you will know all about my day trip to Llandudno during the first week of September. The seaside is one of my favourite places to be hence why I made a blog post out of it. Although I nearly lost my head to a seagull and my mum had a doughnut snatched by a hangry mob of them, it was a lovely day out and somewhere I would recommend visiting if you get the chance! 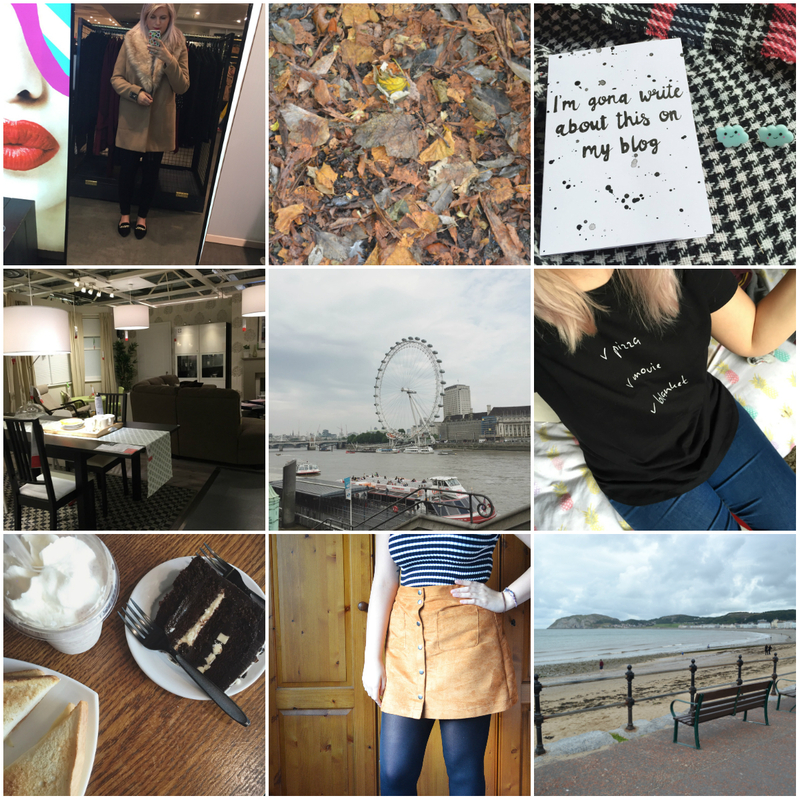 What did you get up to in September? If you have any posts overlooking the past month, I'd love to read them. Sounds like a fab month. Can't believe that Primark coat, what a winner! I love KB milkshakes, I used to work in a similar kind of shop! It's such a warm and cosy coat, I'd definitely recommend checking Primark out if you're after one! Jemma's etsy store is so amazing! I bought a card reading 'Blog Your Heart Out' which is on my desk, and I got the halloween grips. She's also super lovely! Also, you will love Winter Wonderland. It's so magical and makes you so ready for Christmas. Isn't she just the sweetest? I love everything she sells! This is such a lovely idea! Kind of a pretty twist on a favourites post :) love it! I LOVE that coat, I really need to go to Primark! Great post! Love th coat! And my gosh that kinder Bueno milkshake looks delicious!!! Lovely photos! That milkshake sounds delicious!! September flew by for me and I'm left wondering where the time went!! I love the idea of a little collage, I may borrow this... Such a nice way to sum up the little things that make up your month :) that coat is incredible, can't believe it's only from primark?! You had me at Kinder Bueno Milkshake - damn, that sounds too good to be true! This post seems to have exposed a lot of milkshake lovers, and I'm ok with that! I love the warm colours here! That cake looks delicious and I love your tan skirt. You lucky thing, living in Dubai, what a dream! I love the "I'm going to write about this on my blog" shot! AMAZING!! Kvelling over that Kinder Bueno milkshake...!! !